When I turned eleven, my mum took me out for what felt like the most grown up meal ever at the Horwich institution which was Max Max. We invited my friends Jenny and Natalie, I got a new frock from Tammy Girl (it was amazing...), and I'm pretty sure we all had lasagne that bubbled like Mount Vesuvius. I haven't stepped foot in the old Max Max building since. I won't go into detail, but that was some time ago. A couple of years ago, the owners retired and up popped Thai restaurant Siam Balcony, which was a bit of a damp squib. 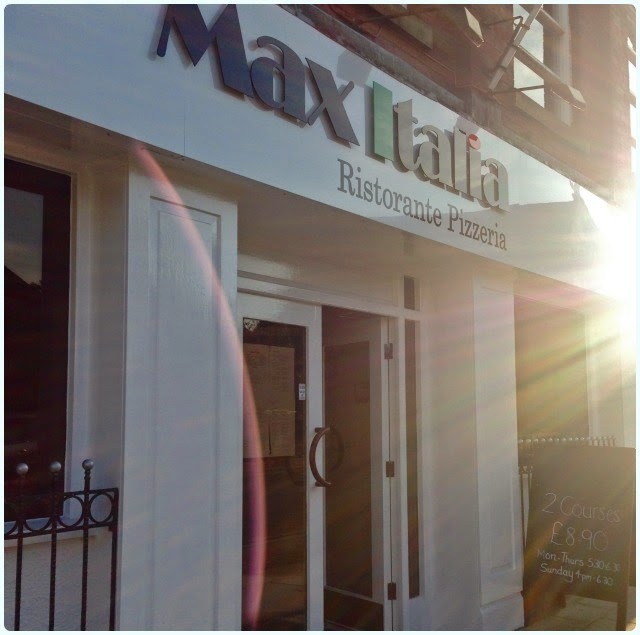 Then, almost overnight, Max Italia appeared. One thing we're not short of round these parts is Italian restaurants. 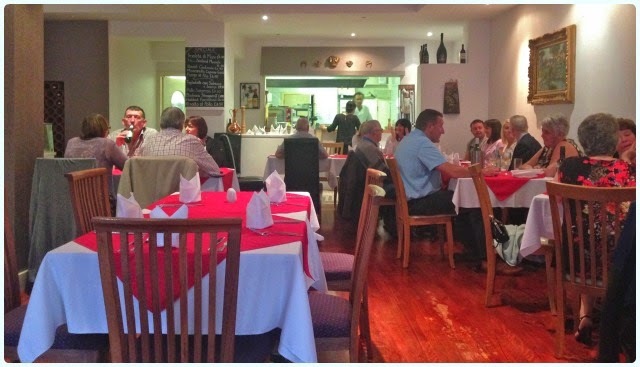 There's Leo's and Il Toro in Horwich, then Luciano's and Chianti within a 10 minute drive of the town centre. Being the perpetual greedy pig, I still had to try it. Inside feels a little dated, and has the typical napkin origami and red accent tablecloths. The chairs don't match the decor, however the service is fast and friendly. We arrived around 8pm on a Saturday night, and the place was already heaving, with more waiting to be seated. Pane all’Aglio con Formaggio: I'd been to cake club during the day, so all I wanted in the whole wide world was cheese. This garlic bread with melted Mozzarella was huge! The dough was soft and fresh, and there was plenty of cheese. I'd like to tell you that we left quite a bit of it because it was so huge - no, we did not. 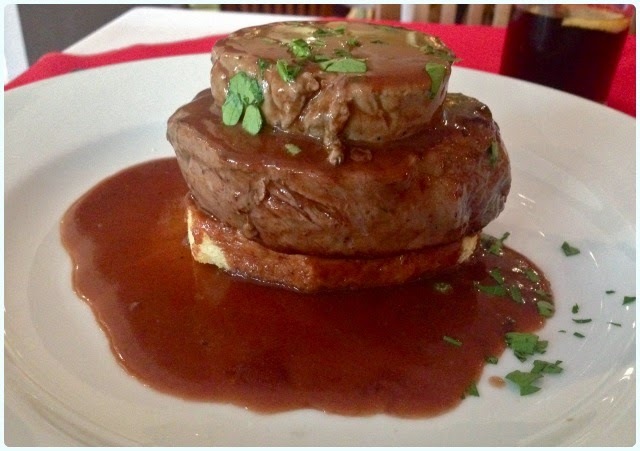 Filetto Rossini - fillet steak served on toast, topped with paté and red wine jus: This was my husband's choice. A big chunk of steak topped with enough paté to keep heart surgeons in a job, and a rich red wine sauce. The only thing he wasn't sure about was the toast, which soaked up those lovely juices and became a little soggy. 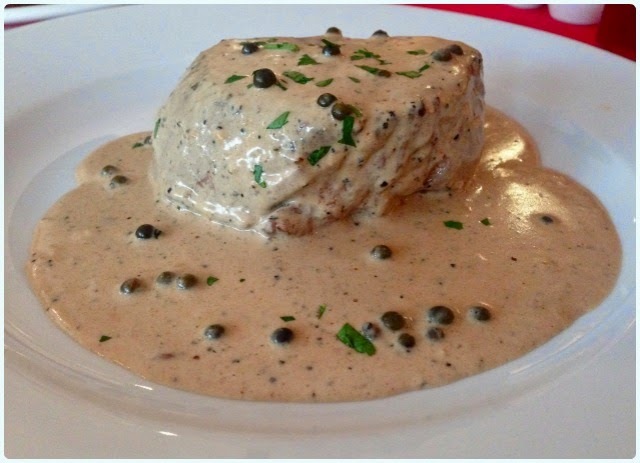 Filetto al Pepe Verde - fillet steak in a creamy green peppercorn sauce: My favourite dish from any Italian restaurant. I cannot resist. This one was absolutely delicious. 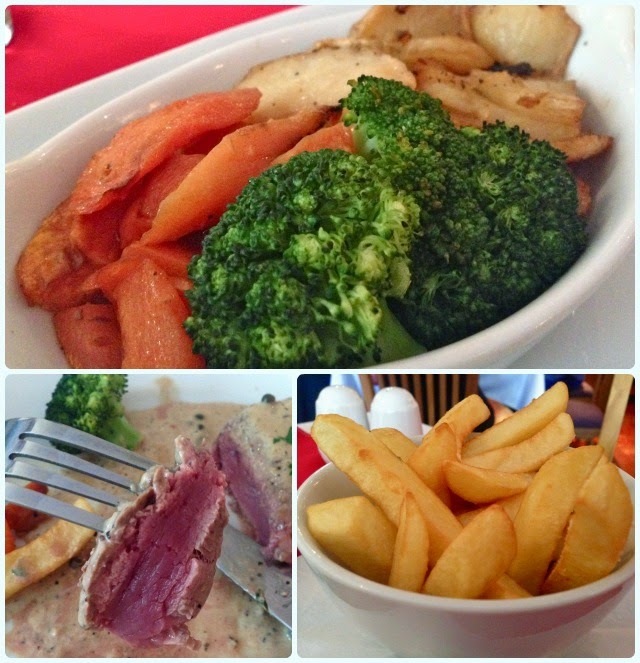 Cooked perfectly rare and drenched in that wonderfully creamy green peppercorn sauce. Sides - seasonal vegetables and chips: Steaks come with a choice of sides, so we opted for one of each, completely dismissing the salad option within a second of it being suggested. Beautiful al dente broccoli, sweet oven roasted carrots and these crisp sliced potatoes with herbs. 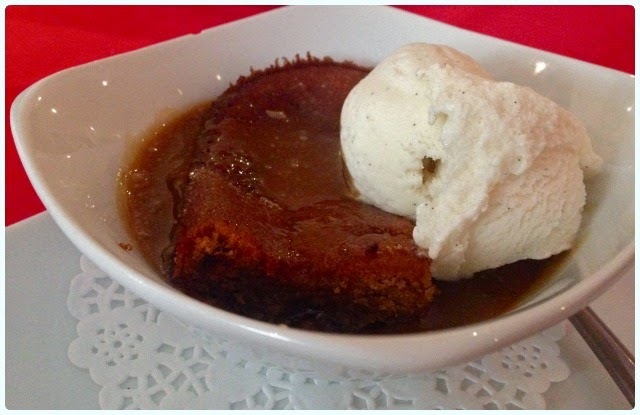 Sticky toffee pudding with ice cream: Home made puddings? Yes please. 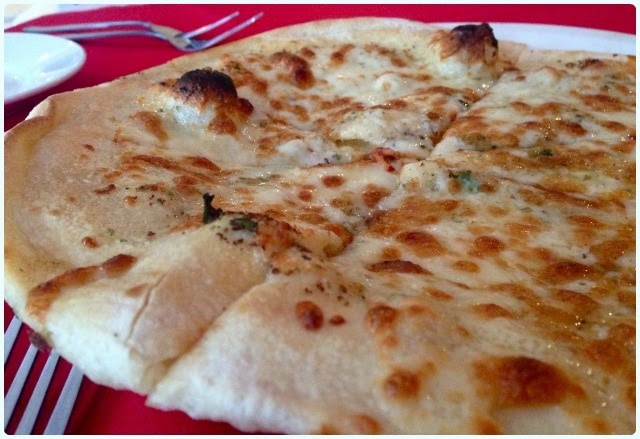 We shared this because our earlier garlic bread faux pas had left us feeling a little like creatures. But then they threw 'home made' into the equation. Light as a feather with that caramelised edge that I love. If I'm being honest, we weren't expecting that much from Max Italia. We went because we couldn't get a reservation at Il Toro, but we were so glad that we gave it a go. I really cannot complain about the food, as everything that we were served tasted great and was fantastic value for money. My only complaint (and for you this may be a perk) was the speed. We were in and out within an hour, and we had three courses. Saying that, it was a busy Saturday night and you cannot blame them for turning tables quickly when they have people waiting. It may be a very different affair during the week or earlier in the evening. No, you are not getting the surroundings and beautiful decor of places like Luciano's, but for many, Max Italia will be in walking distance from home or indeed the pub! I can see it doing well in the centre of Horwich for this reason. It is what it is - the ideal place to go for a nice meal either before or after meeting up with friends for drinks.